RACING TOURING CAR 06 ETCC 06 RACING SERIES. THEY RUN GREAT. Gender Boys. SKU: 20418 J. This has only really slight marks. Check out the DD Slots. “Spend a Little, Race a Lot!”. Credit / Debit Card. Thunder Tiger Raptor. CAR TRUCK KIT. 1/32 Scale Analog Slot Car. Scale 1/32. Inline Motor. You Can Trust. UPC Code:Does Not Apply. UPC Does Not Apply. THE CARS RUN GREAT. Gender Boys. Luigi Fagioli. NUMBERED EDITION OF 1.500 PIECES. 1:32 SCALE. Scale 1/32. This car will work on almost any 1/32 analog (non-digital) set, such as Carrera, Ninco, SCX and more. 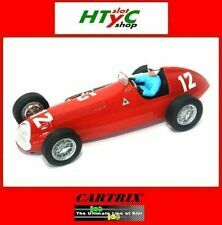 Scalextric "Micro Set" Pro Street Speed .Alfa Romeo 159.little used. 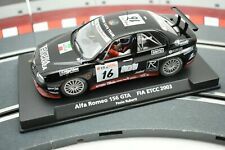 Micro Scalextric Alfa Romeo 155 Race Car. Condition is Used. Dispatched with Royal Mail 2nd Class. Marke Carrera. with front light (Xenon) and Rück-/Bremslichtfunktion. 96095 New New. Referencia: E802 96095. MPN E802 96095. SCALE SLOT CAR 1:32 MARK VALID FOR ALL FLY. DON'T OPEN CASES - EVERYTHING WILL ARRIVE ! Condition: VERY GOOD - SEE PHOTO. SCALEXTRIC / SUPERSCALE K.309 OR C.197. Gender Boys. # 07049 FLY CAR MODEL 1/32 SLOT CAR. THEY RUN GREAT. BUY 5 GET THE 6TH CAR FREEEEEEEEE. Gender Boys. CARS GREAT CONDITION NEW. 88215 a-1104 FLY. MPN 88215 A-1104. No 44 B. SIMONIS. 24 h SPA 71. MPN A804 88150. REF A 804 88150. (Triang, Exin, Tico, order, Scx, Planet Toys, Openslo, Tecnitoys, Fly, Borras, Scalextric). REFERENCIA: 88252. NUEVO SIN ESTRENAR Y COMPLETO CON SU CAJA ORIGINAL. Fly TEAM 10 Ref. BOX 1/32 New. Referencia: TEAM 10 96052. MPN TEAM10 96052. SCALE SLOT CAR 1:32 MARK VALID FOR ALL FLY. Or by phone from 16 h to 23 h 949230961 (José). CAR TRUCK KIT. Manufacturer:SRC Slot. 1/32 Scale Analog Slot Car. Model 1:32 Scale Slot Car. Nitro Engines/Parts. Model Kits/Toys. You Can Trust. Strong Magnet. 4 PAIRS REAR TYRES FOR ARTIN 1/43 width 6 mm. Ref. : SP600019EVO. Directly supplied by Sloting Plus. Picture from a show model item. New in box. Scale Compatible 1: 32 Scalextric. Neumáticos BRM de 25,5 x 7 mm. The set includes 4 excellent tires BRM type slick. Tires BRM 25.5 x 7 mm. Each lot includes 4 excellent tires BRM as 25.5 mm x 9 mm type slick, for 23 "rim. You tires compatible with older models of Scalextric UK and Pink Kar. REFERENCIA: A1104 88215. MPN 88215 A1104. Thunder Tiger Raptor. CAR TRUCK KIT. 1/32 Scale Analog Slot Car. Scale 1/32 Slot Car. Quality Products. UPC Code:Does Not Apply. Warranty:Full Manufacturer Warranty. Item #:Fly_07063. Is located (benefit-of-the-doubt principle). is done under the suspensive. the country in which the respective. mandatory provisions of the law of. (1) German law shall apply. This choice of law. your proposed price. New in box. Scale Compatible 1: 32 Scalextric. Mint boxed. 1:32 scale. Scalextric compatible. FREQUELIN - DELFERRIER. MPN 88130 A-802. Not 40 R ' 75 Monte Carlo. Scalextric Super 124 car instructions, not original. Referencia: A803 88133. MPN A803 88133. SCALE SLOT CAR 1:32 MARK VALID FOR ALL FLY. (Triang, Exin, Tico, order, Scx, Planet Toys, Openslo, Tecnitoys, Fly, Borras, Scalextric). Thunder Tiger Raptor. CAR TRUCK KIT. Fly Bmw M3 E30 Art Car Ken Done. 1/32 Scale slot car. Limited Edition. Quality Products. UPC Code:Does not apply. Warranty:Full Manufacturer Warranty. 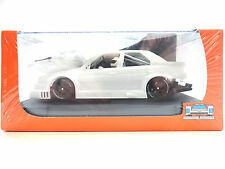 The car is new, never used and original boxed. Suitable for Carrera digital 132 and compatible for Carrera evolution as well. Compatible with the analogue evolution car. MPN 96052 team 10. Peninsula and Balearic ISL. The car is new, never used and original boxed. Suitable for Carrera digital 132 and compatible for Carrera evolution as well. Carrera digital 132 - new original box - art. Compatible with the analogue evolution car. New in box. Scale Compatible 1: 32 Scalextric. Mint boxed. 1:32 scale. Scalextric compatible. you buy what you see, if you are looking for an impeccable Blue Alpha, this is not is your car! COLOR BLUE HALF GREEN HALF. Thunder Tiger Raptor. CAR TRUCK KIT. 1/32 Scale Analog Slot Car. Inline Motor. UPC Does Not Apply. Strong Magnet. Quality Products. UPC Code:Does Not Apply. Item #:SICA11H. MPN SICA11H. CAR TRUCK KIT. 1/32 Scale Analog Slot Car. Nitro Engines/Parts. UPC Does not apply. Strong Magnet. 21,000k motor.